America's Cup is a World Yachting Championship of huge international scope. America's Cup has been referred to as the "Formula 1 on sea" and the third biggest world sports event after the Olympics and the World Cup. The America's Cup trophy is considered to be the "Holy Grail" of the yachting world. America's Cup is very much a sport of gentlemen, with its complex structure of duels and challenges, reminiscent of medieval knight tournaments. This is the 32nd America's Cup since 1851. The winner of each America's Cup hosts the next one in his homeland. And ever since the first America's Cup was won by an American team, the trophy has never returned to the shores of Europe. Until now - the last America's Cup was won by Switzerland which has chosen Valencia to host the 32nd America's Cup. So it is the first America's Cup in Europe since the origins of the Championship. On the other hand, 32nd America's Cup is very significant for Valencia as a city. It is expected to have a strong impact on Valencia's international and tourist image. Historically, the yacht that holds the America's Cup trophey is challenged by another yacht, thus setting stage for the next America's Cup. Hence the terms defender and challenger. This year's defender is Alinghi of Switzerland. 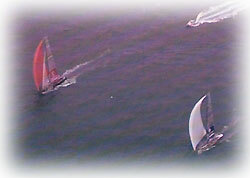 However, in the recent years a serious of Luis Vuitton Acts were added - a set of selection regattas to produce a single challenger from multiple contenders. The 32nd America's Cup sees 11 contenders, of which only one will eventually challenge the defender Alinghi. There is a recycled fable about the origins of the America's Cup that gave the Competition its tag line - "There is no second". The America's Cup is named after the US yacht America which raced 15 yachts from the Britsh Yacht Squadron in 1851 around the Isle of Wight. When America arrived at the finish there was noone behind her. The Queen asked who was second and was told that there was no second. Meaning, the performance of America was so outstanding that all of the British yachts had either gone out of action or were so far behind that the horizon was clear for a few more minutes. Since then, this became the motto of America's Cup, reflecting its all or nothing philosphy and structure. America took the America's Cup to the shores of USA and the American yachts successfully defended it every time up until now, with only a few losses to New Zealand and Australian teams in the last 20 years. Now, it is the first time that the America's Cup arrives to Europe since the beginning. All in all, if you are in Valencia during the 32nd America's Cup, you may want to watch it. It's not like watching a sports game where you really have to be into it to enjoy. America's Cup Port is a magnificent complex built specifically for the 32nd America's Cup, and the races itself, displayed on large screens, are quite a spectale. You can also see the yachts racing on the sea. The elegance of XXI century cutting edge yacht design is also spectacular and you can see them up close as they come in and out of the America's Cup Port. In addition, the America's Cup Port will have lots of fun America's Cup-related activities at which you can have a go.